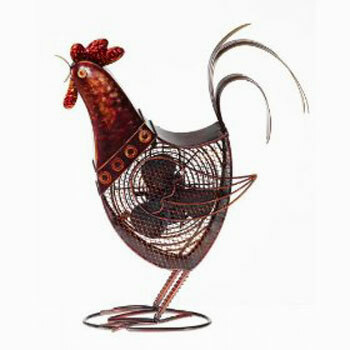 7 Modern Animal Figurines Have Fans, If Not Collectors! You may pay a lot for those collectible porcelain animal figurines, but they're pretty boring. 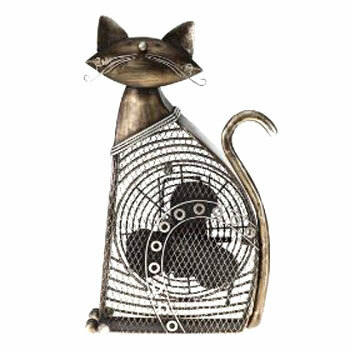 Deco Breeze has created some gorgeous metal animal sculptures that are not only artful, and pay wonderful tributes to the animals they portray, but they're functional. 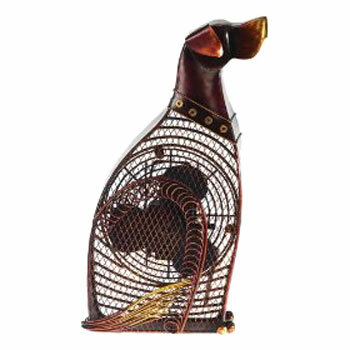 They're fans, real breeze-making fans, but the kind that won't stick out of your decor like you took them home from the office. 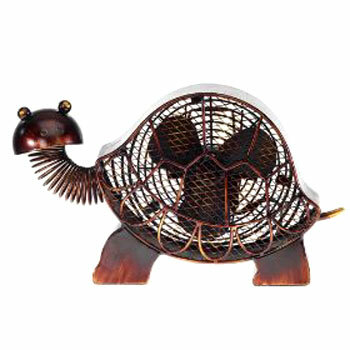 These Deco Breeze Figurine Fans are quite stylish in cast-metal that may be chrome, copper, brass, pewter, or golden in finish. Each fan is 8 x 6 x 17-1/2 inches, perfect for any living area in the house.The fans have three nice-size blades and a 20-watt copper-spun motor. They may not look like they're easy to clean, but the manufacturer lists that feature as one of the selling points. (Maybe a candidate for a feather duster or a gas duster that's used to clean many electronic products. It doesn't matter the breed, this figurine captures the loyalty and honor of a dog, one just waiting to hear the word, "play" or "ball." The different tones of copper, bronze, and gold create the perfect finish to this metal sculpture. 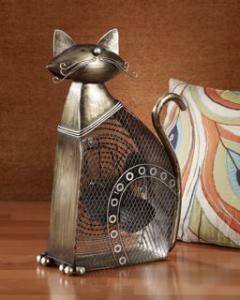 The devilish cat mustache à Dali is a perfect touch for the wily cat. You can almost see him twirling those whiskers. Completed with lovely motled pewter and chrome finishings. Again, beautiful metal work in the ribbon tail feathers and the mottled copper head and crest. I love the expression in the face! 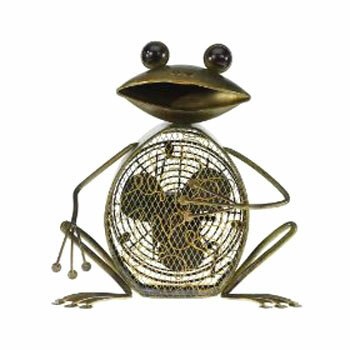 For you frog collectors the Frog Fan is a must have. What eyes! The decorative squiggles on the fan belly and the frog's "finger" pads are delightful too. Here again, you get the most marvelously playful turtle. And isn't that a perfect coil neck and turtle shell? 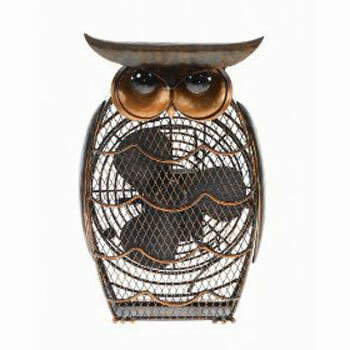 This fan would be great for a kid's room, but so would they all! And here's the wise owl, or maybe even the Wise® owl. Is he wearing glasses on those wise old eyes? Who knows, but the effect is super! Wow! 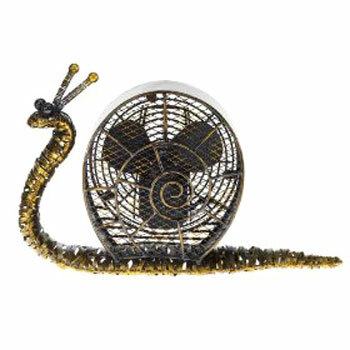 Exceptional metal work on the Snail Fan and lots of bling to boot -- but all achieved with finishes. Love the bulging eyes and antenna caps! I wonder about collectors... The Deco Breeze figurines are awfully fun and functiona. I wouldn't mind having one of each animal in my home... not at all.